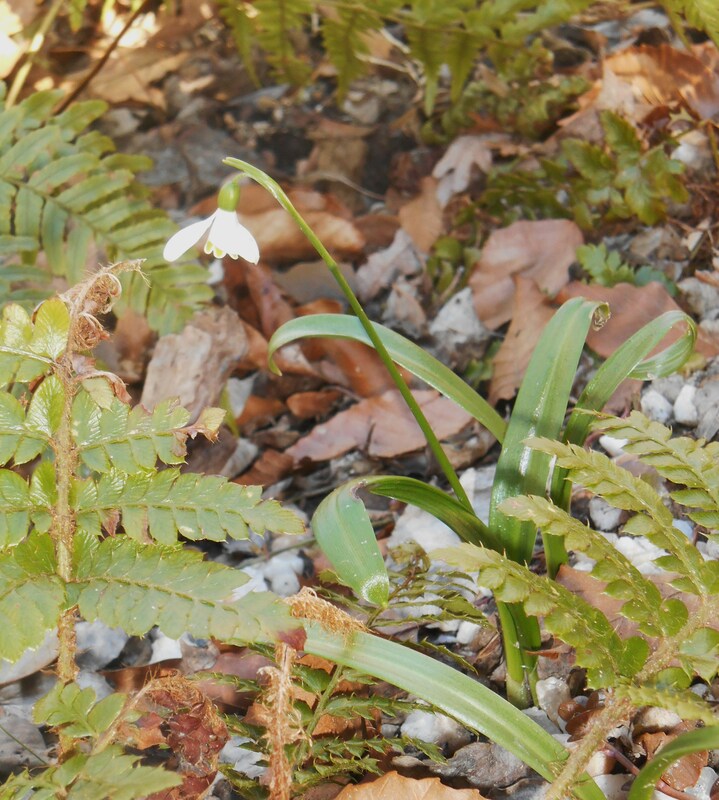 We’ve not yet had a proper winter; and here is the first snowdrop. It caught me by surprise. I noticed it earlier, as I headed inside laden with groceries. 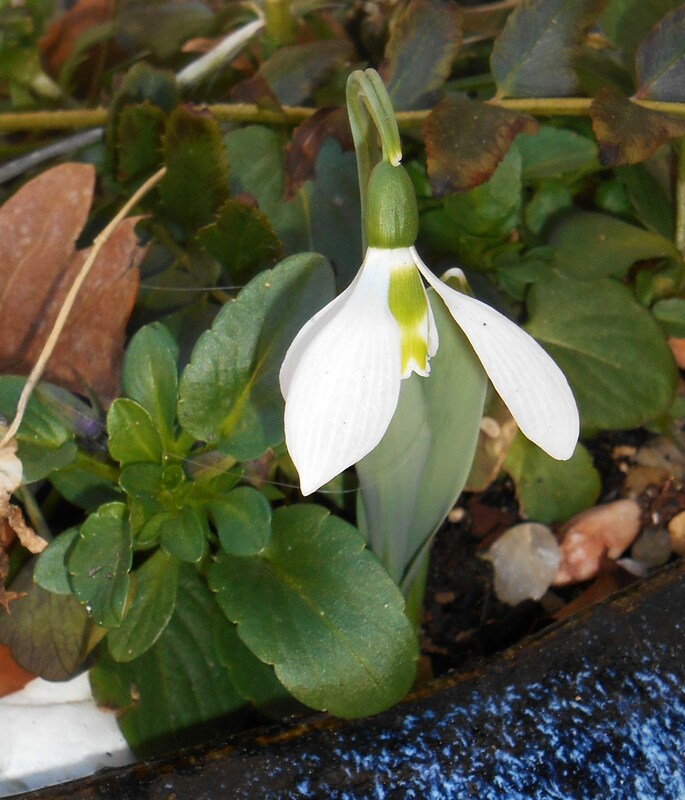 There nodded a perfect white flower, harbinger of spring, on this January day. Thus far we’ve imbibed real winter only from the Weather Channel. Our cold has come in short two or three day bursts, interspersed with days which leave us wondering whether it is November or May. We did have two hard freezes earlier this week. The stalwart Geraniums, left behind near the backdoor when their cousins came inside, finally succumbed; or almost. “….. Not dead yet!” Damaged leaves cloak still living stems and roots. But the bulbs are awakening. Tentative green leaves have shown themselves in all parts of the garden now; just as the last of this year’s lot were buried in the still malleable soil. And the Hellebores! Like precocious schoolgirls, they are flirting with the sun as though it were March already. It’s January, but we haven’t seen a flake of snow. The front lawn has sparkled with frost a time or two, so pretty in the morning sun. But who can argue with spring? No matter how late or how early, swelling buds and fresh green leaves never fail to make me smile. Who wants to look at empty pots for the next four months? I am as interested in planting attractive pots for the winter season as I am interested in replanting those pots for summer. And each fall, I keep an eye and and ear open for new ideas. Brent Heath offered a workshop last month at his Bulb Shop in Gloucester that I sorely wanted to attend. He even offered to bring his workshop across the river if I could pull a group together in our community. And how I wish my time and energy had stretched far enough to invite him! Brent, a master horticulturalist, teaches the finer points of loading containers with bulbs. 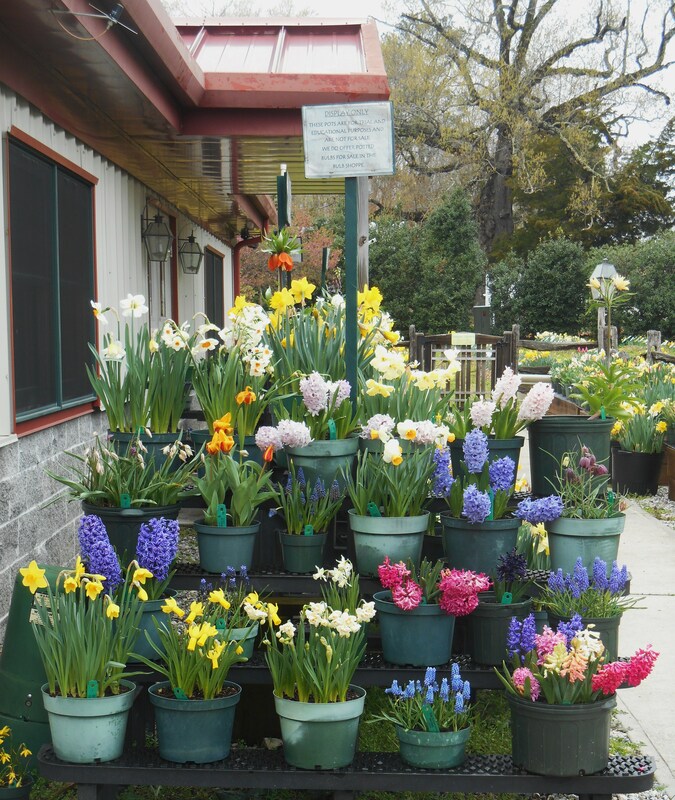 Now even though he and his wife Becky are known internationally for their prodigious offering of Daffodils; they sell hundreds of different bulbs and perennials. 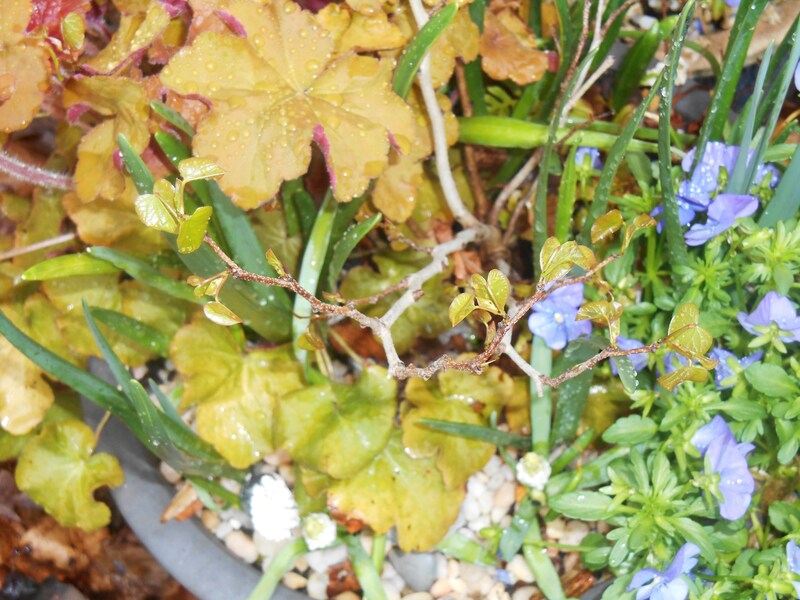 Brent’s workshop teaches how to layer several different species of bulbs into a single pot to create a “Living Flower Arrangement” which changes over time as different bulbs appear, bloom, and fade. I wanted to attend Brent’s workshop to learn a new trick or two. I’ve used various bulbs in containers for many years now, but there is always a better way, when one is open to learn from someone more experienced. But the stars haven’t aligned this season, and so I’ve been experimenting on my own with the bulbs we’ve been collecting. The idea is elegantly simple: since one plants bulbs at different depths depending on the size of the bulb, and since new growth from most bulbs is very narrow before it reaches the light, one can plant one ‘layer’ of bulbs on top of another, allowing the emerging stems to sort out the spacing as they grow upwards towards the light. In fact, three or four ‘layers’ of different types of bulbs may be planted into a single large pot. This very crowded planting works for a single season, but must be unpacked by early summer. The bulbs may be transplanted ‘in the green’ into garden beds, to allow the leaves to fully recharge the bulb for the next season of flowers. 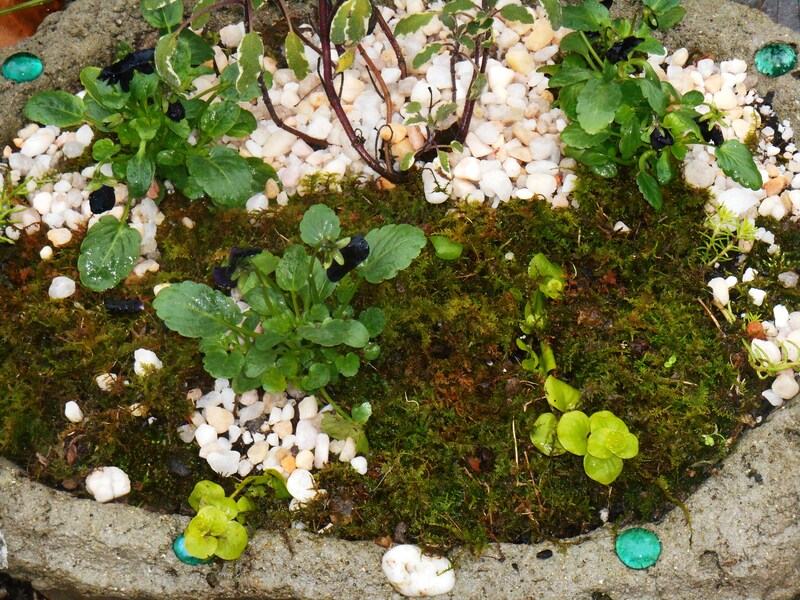 I modify this idea to include annuals, perennials, woodies and moss so the planting has immediate interest while we wait for the bulbs to emerge in the spring. Begin with a clean pot. I use coffee filters or a paper towel over the drainage holes to hold the soil while the roots are growing. The filters will soon decompose. Choose a good quality, light, commercial potting soil with nutrition already mixed in. The annuals and perennials are heavy feeders, and the bulbs will perform better in rich soil. Many of the ‘organic’ potting soils now come pre-loaded with worm castings! Now one must ‘do the math.’ Having chosen 2-5 species of bulbs, depending on the size and depth of the pot, first study the proper planting depth of each. If you are using Daffodils, for instance, which are planted at a depth of 6″, then fill the pot with soil to within about 7″ of the rim. Set the first ‘layer’ of Daffodil bulbs on the soil by pushing the root end slightly into the soil so that the tip points upwards. Space these Daffodils 3″-4″ apart from one another and at least an inch or two inwards from the sides of the pot. Carefully fill in around these bulbs with more potting soil so they are barely covered, and firm the soil with your palm. Violas under a potted Redbud tree grow here with Heuchera and Daffodils early last spring. Choose your next bulb, adding just enough soil so it is planted at its correct depth, and arrange these bulbs by lightly pushing them into the soil. Try to avoid setting a new bulb directly over top of a deeper one. Lightly top with soil to hold this layer in place, and add an additional layer or two of bulbs. 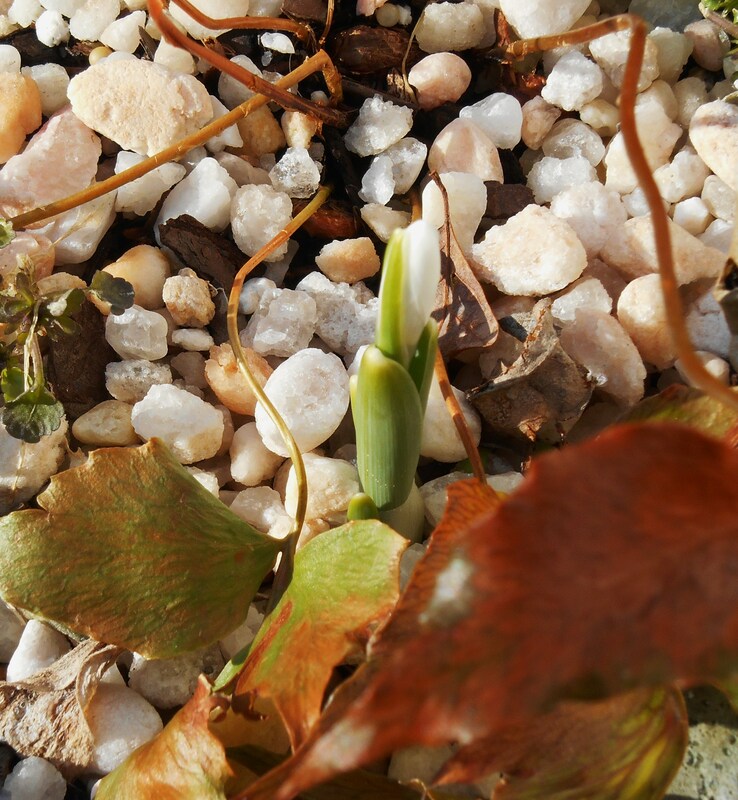 I like to select a few bulbs, like Crocus, Muscari, or Galanthus nivalis, which will emerge in late winter. These will often be the ones planted most shallow. 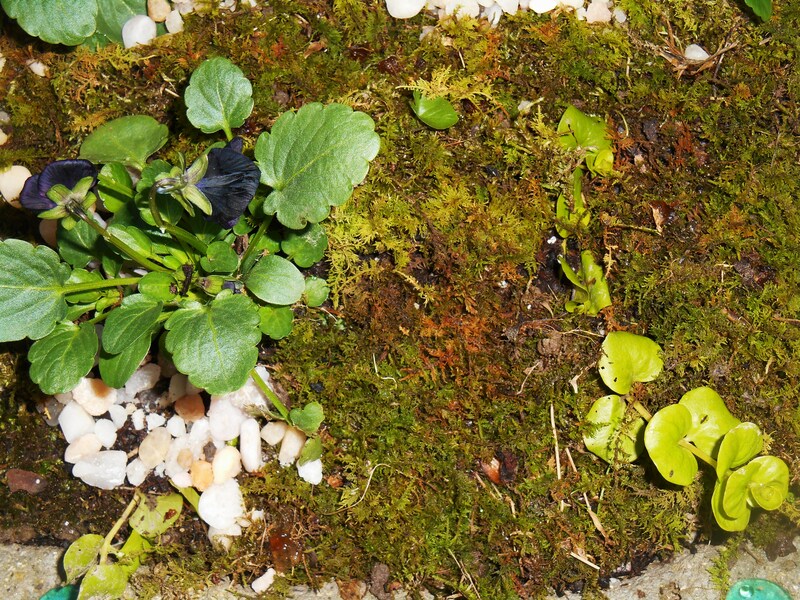 Miniature Iris and Muscari are planted in a grid beneath the moss. Violas fit between the bulbs. I’ve tucked in rooted cutting of Creeping Jenny for color. These turn bright red in a harsh winter. If your living flower arrangement will contain only bulbs, then simply top off the soil with a layer of living moss, water in, place the pot, and wait. 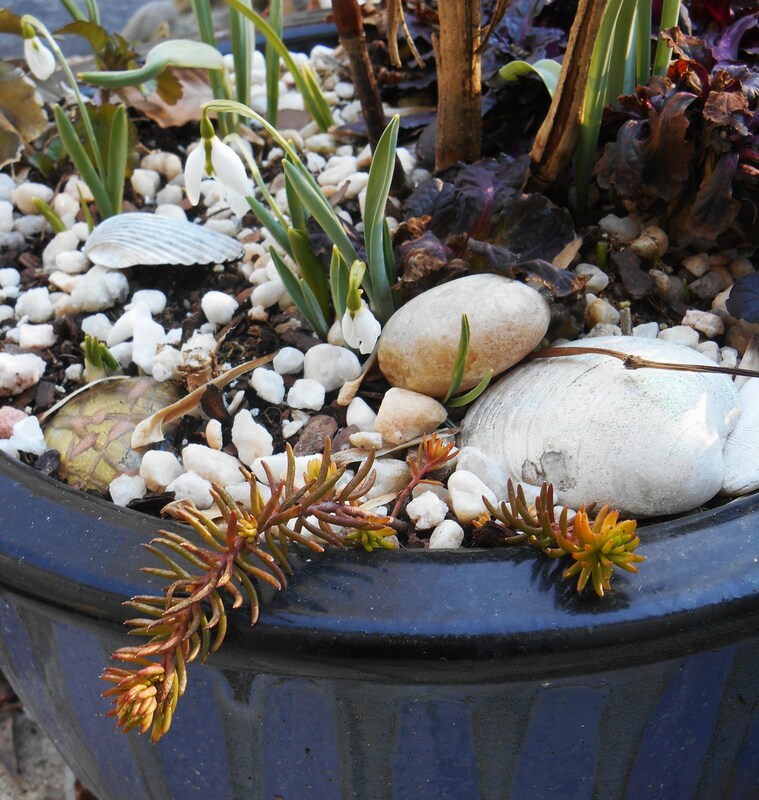 You can certainly add a few branches, pods, stones or cones to the pot to catch the eye while you wait for spring. Violas with Creeping Jenny and a hardy Sedum ‘Angelina’ last April. But I want a living flower arrangement which goes to work right away. I always add some annuals or perennials to the mix, which complicates the bulb planting a bit, as you don’t want bulbs directly under the huge root ball of a perennial or shrub. 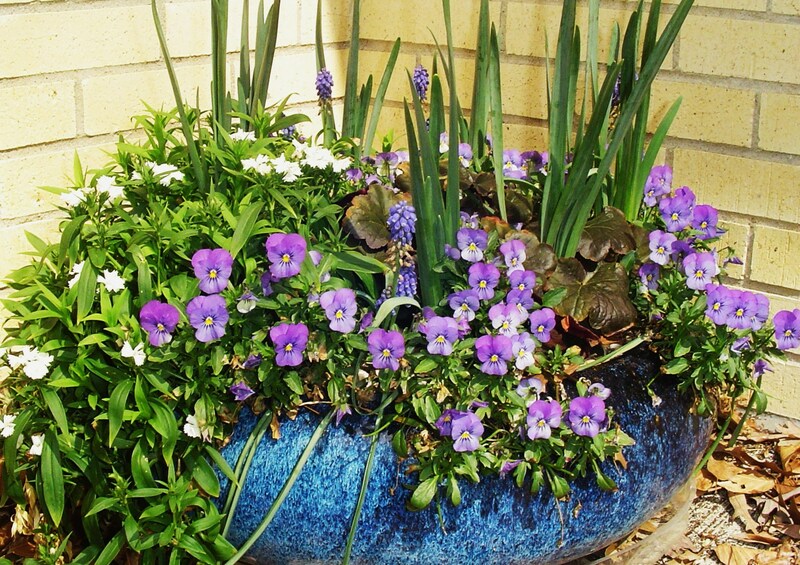 I tend to place a shrub or perennial in the pot first, then plant the bulbs around it. This is a good use for those clearance shrubs with tiny root balls so easy to find in late October or November. Or, for the many evergreen shrubs showing up now in tiny quart or 1 gallon pots. Many vines and some perennials root easily from cuttings. 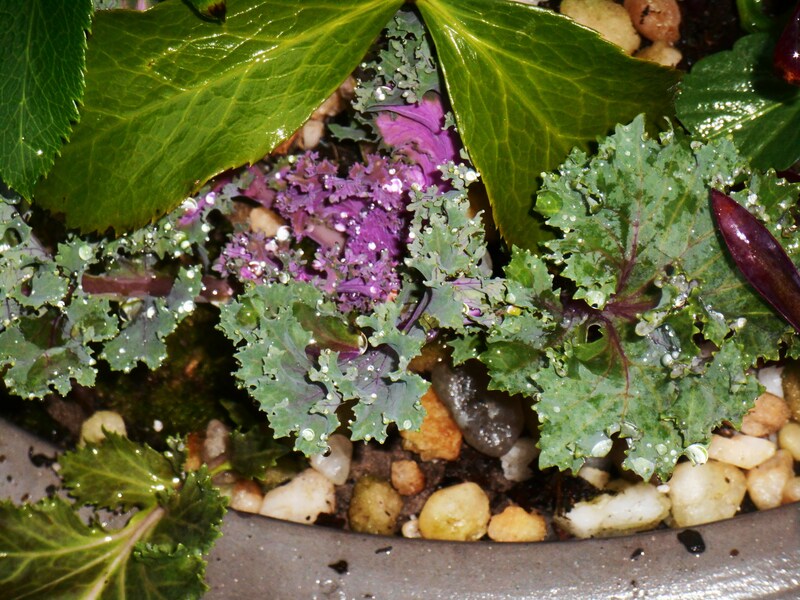 Simply tuck bits of Creeping Jenny, hardy Sedum, or divisions of Ivy or Ajuga into the soil of your finished pot. These will grow in place. Consider sprinkling seeds for perennials like Columbine, which like to overwinter out of doors. They will begin to sprout next spring as the bulbs emerge. 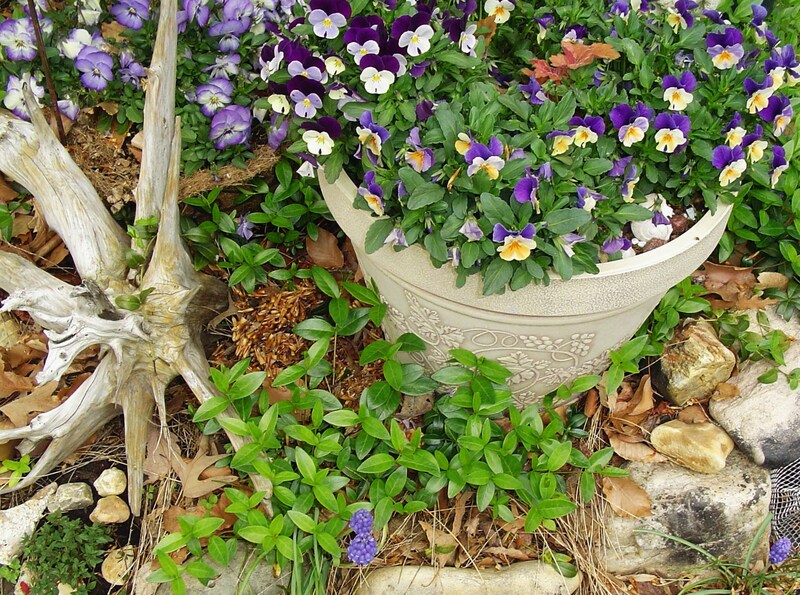 You might complete your design with some winter annuals. 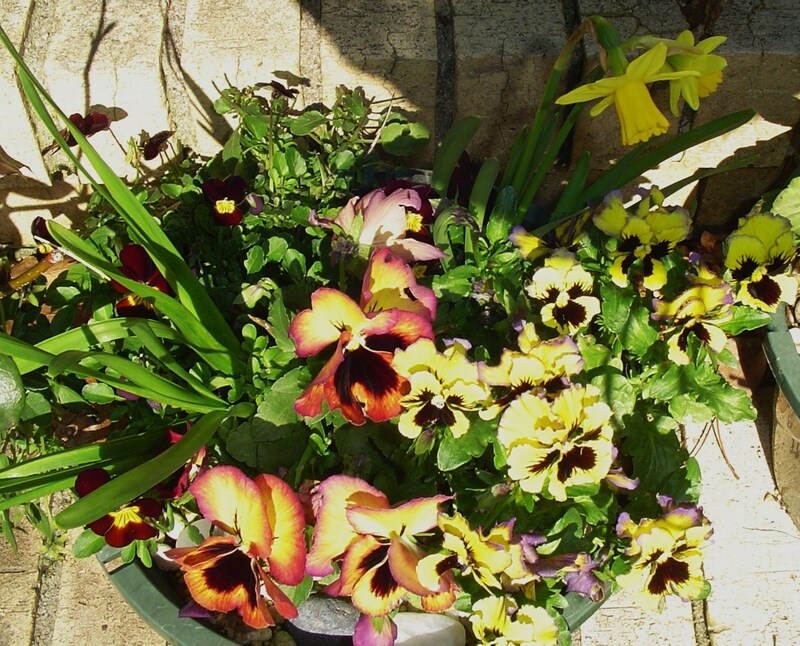 You can pot up the deeper layers of bulbs, and then plant a few Violas, Pansies or snaps in the top three inches of the pot. 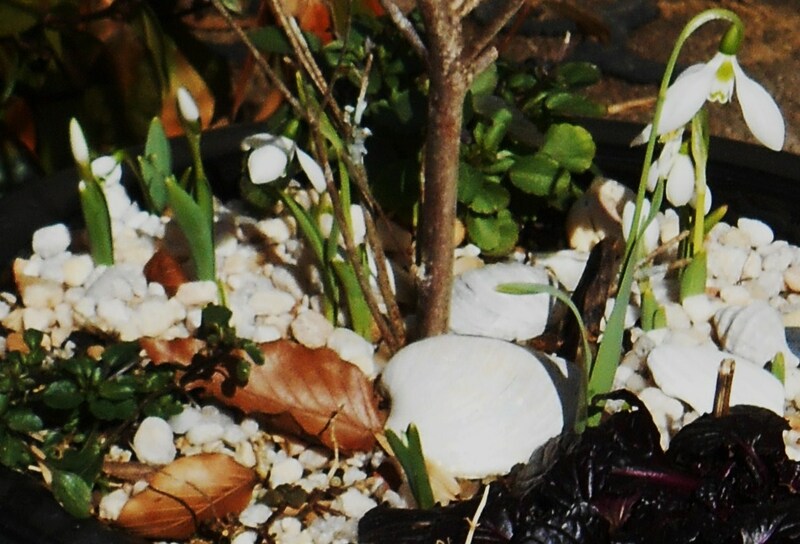 Layer in your Crocus and Muscari bulbs around them. I still finish the pot with moss or pebbles. This topdressing not only looks more attractive than plain dirt; it helps hold moisture, insulates the roots as temperatures dive, and it offers some protection from digging squirrels. If I were using Tulips in the pot, I would be tempted to lay some chicken wire, with large openings, over that layer of bulbs for further protection from marauding rodents. Tuck in a few cloves of garlic or onion sets to protect your Violas from grazing deer and rabbits. Now, the ultimate ‘multi-tasking’ for this sort of planting: hardwood cuttings. Many of our woodies will root over winter if stuck into moist soil and left alone for several months. If you have some shrubs you would like to propagate, take your cuttings and push them artistically into the finished pot. If they root, fine. If they don’t, you have still enjoyed the extra sculptural elements they lend over winter while the bulbs are sleeping. I’ve added a hardwood cutting of fig to this new mixed planting with bulb and other flowering plants. 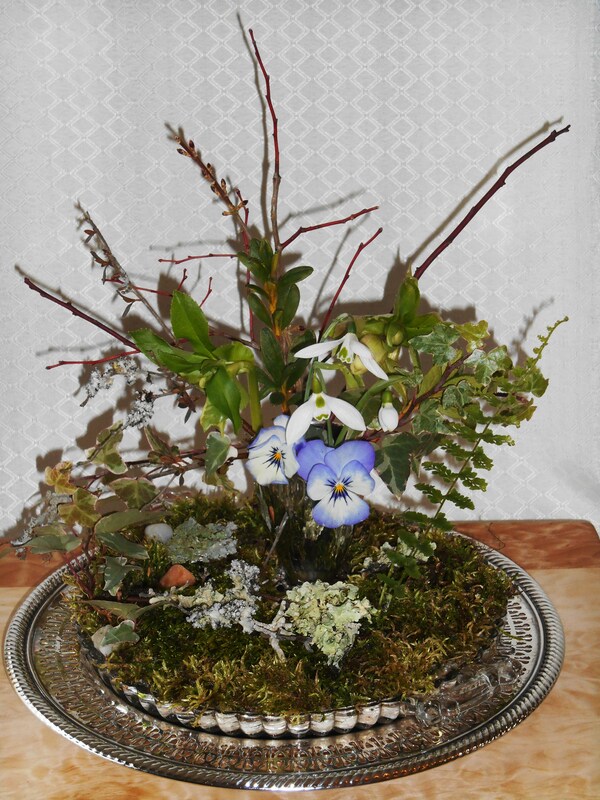 This sort of winter ‘living flower arrangement’ takes a bit of planning. There are lots of choices to make about timing and color schemes, size and scale, costs and placement. You have to imagine how the bulbs will look when they emerge, so the tall ones are more to the center and the shorter ones nearer the edges; unless the shorter ones will finish before the tall ones emerge. And the container must be large enough to contain all of those robust roots without cracking; and of material which will hold up to your winter weather. 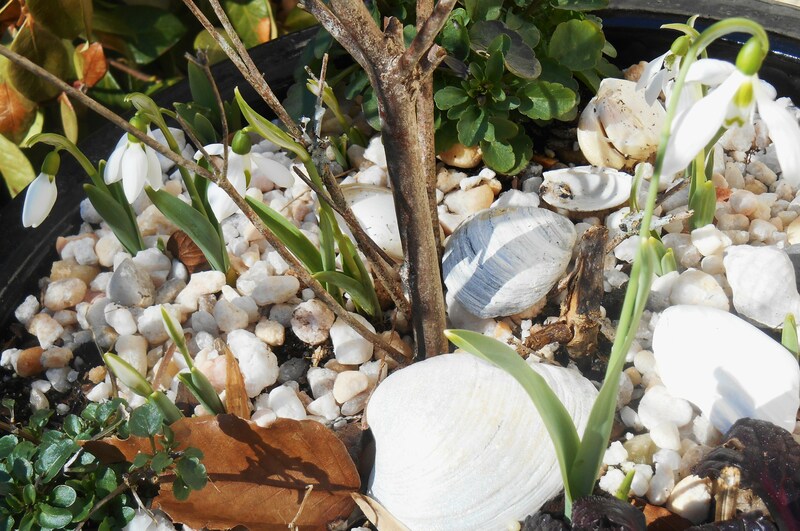 This is an excellent way to showcase miniature Daffodils and other delicate, small flowering bulbs. You might combine several types of daffies to include those which flower early, mid- and late season. Daffodils with blue Muscari always look great together. 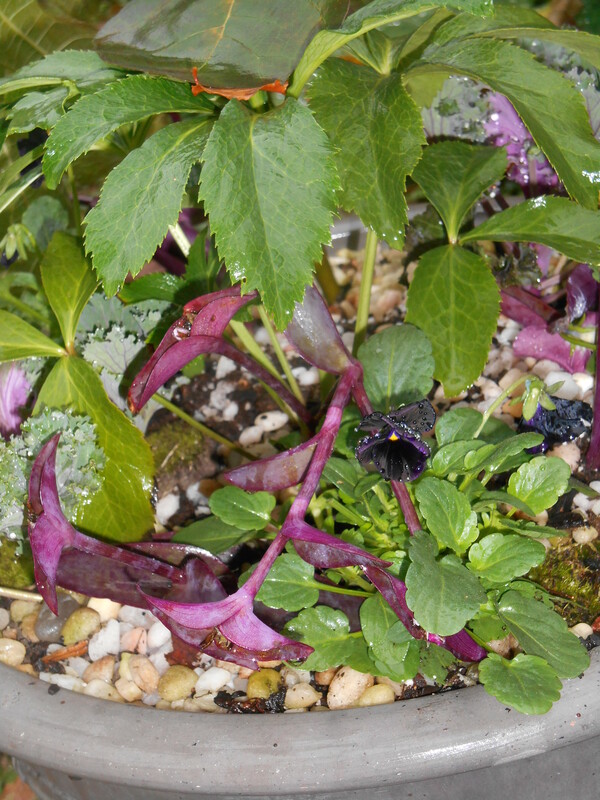 Ornamental cabbage with Hellebore in a newly planted pot. You might also compose an arrangement of various Iris. Include some combination of Iris unguicularis, Iris bucharica, Iris histrioides, Iris reticulata, Dutch Iris, and perhaps even a root of German Bearded Iris for a long season of beautiful Iris blooms. 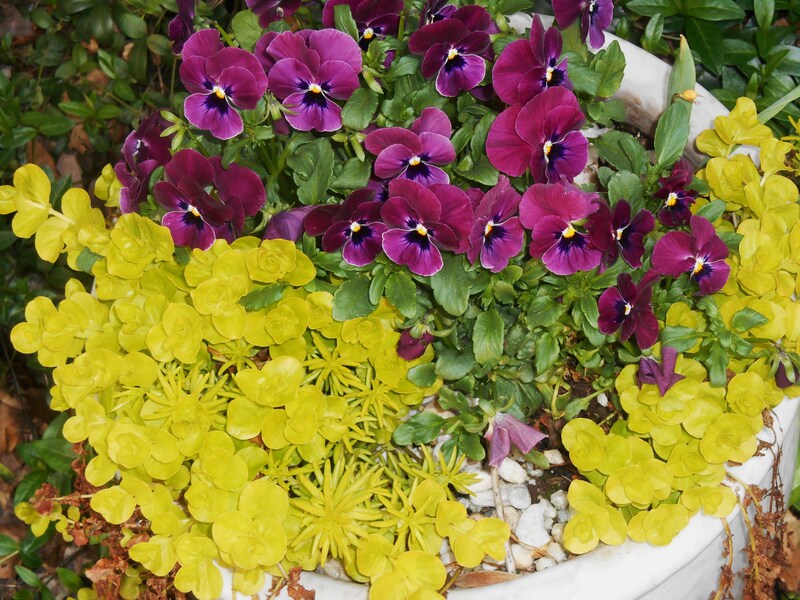 If your winter is especially harsh, plant your container now, water it in, but leave it in an unheated garage or shed until February. Bring it out into the spring sunshine and enjoy the bulbs when the worst of winter has passed. Newly planted Violas with Hellebores. Bulbs are tucked into the soil, waiting for spring. We enjoy the luxury of Zone 7b, which allows us to grow winter annuals which would die a few states to the north, and also bulbs which wouldn’t survive in the warmer winters to our south. We also have many winter or early spring flowering shrubs to plant in our container gardens. 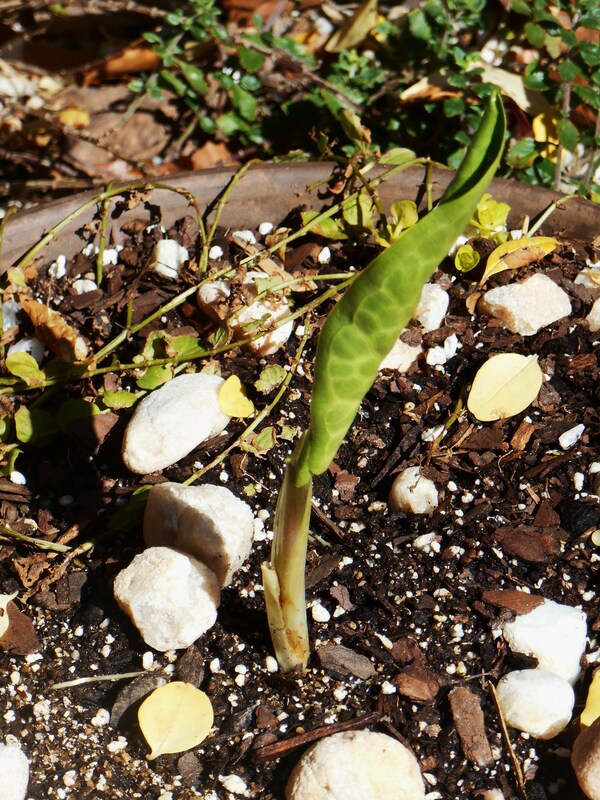 Arum italicum unfurls its first leaf today. The tuber has been growing for about a month now. 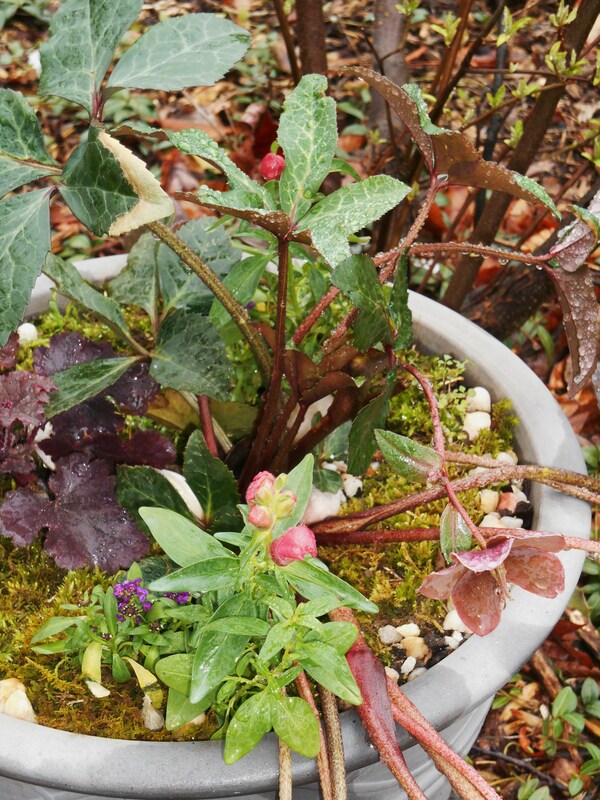 Foliage will fill this pot all winter, with flowers appearing in the spring. 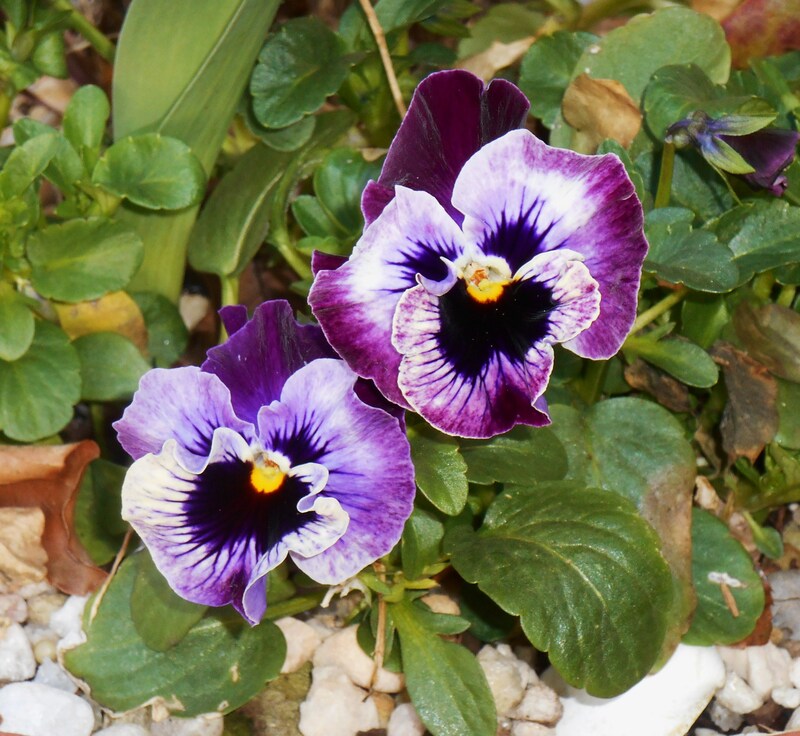 Pansies will soon respond to warmer days and nights with renewed growth. Here with miniature daffodils. 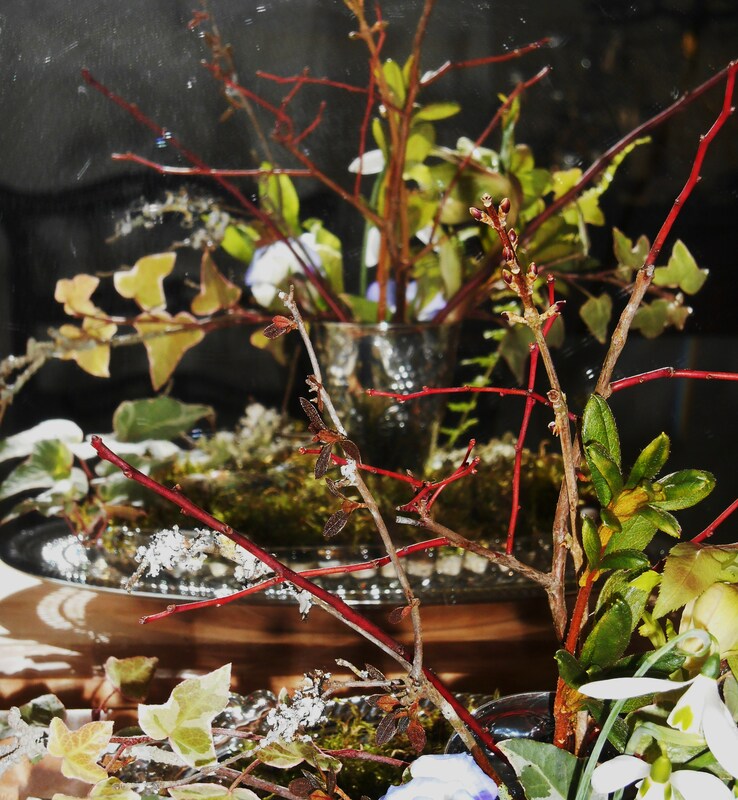 Whatever combination of plants you choose, think of these living flower arrangements as narratives which unfold over time. Time truly is the magical ingredient for baking bread, raising children, and creating beautiful gardens. 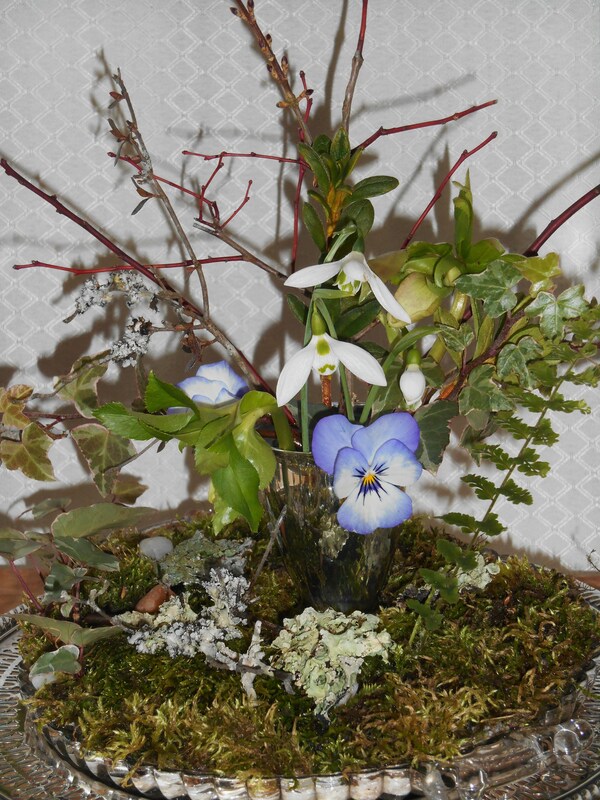 What bits of beauty can you scavenge from your garden on this last Monday of January? Answering the challenge took me all around the garden today with clippers and a cup of warm water in hand. We have the proverbial calm before the storm today in coastal Virginia. It was actually sunny when I headed out mid-day, and almost warm. The wind was brisk, though, which reminded me to make this a quick scavenging hunt. 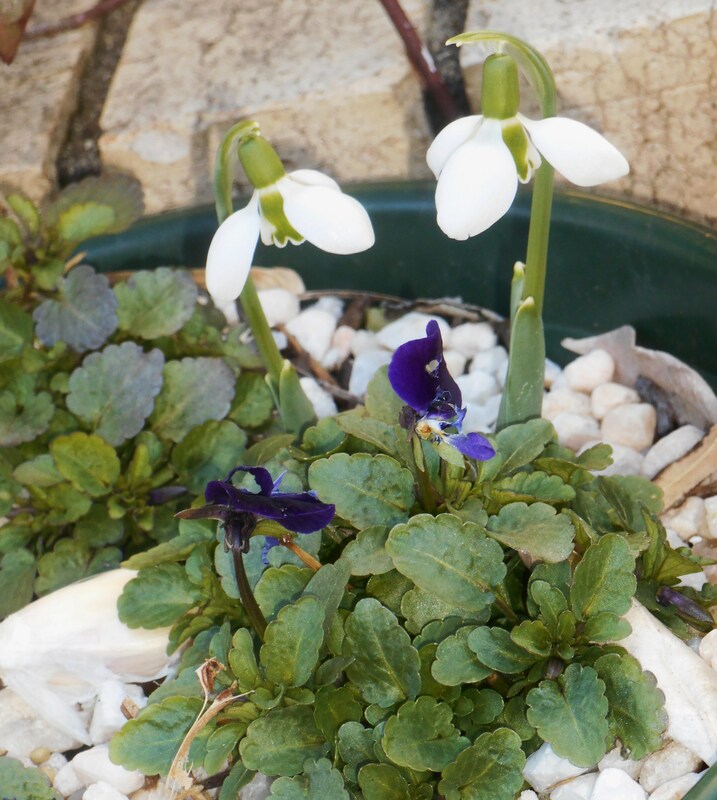 I found more snowdrops blooming in a sheltered spot beneath some box, some white Hellebores just making their presence known in the lower stump garden, and a few bright Viola blossoms. I’ve been admiring the bright red stems of our native blueberry bushes, and so included a few along with some evergreen Azaleas. There are also a few stems of Forsythia, their buds still tightly closed, and some of the variegated ivy growing near the kitchen door. Meager as that may be, it reflects the beauty of our January garden. 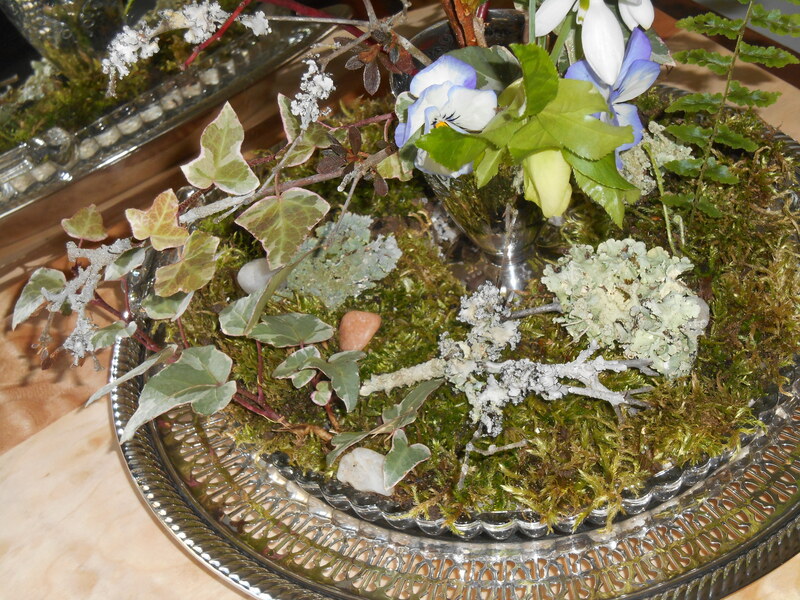 There is a bit of potting soil and sand beneath the moss to sustain the plants growing in the glass plate. And yes, of course the bright vivid greens of our moss and lichen, thriving in this very wet winter. 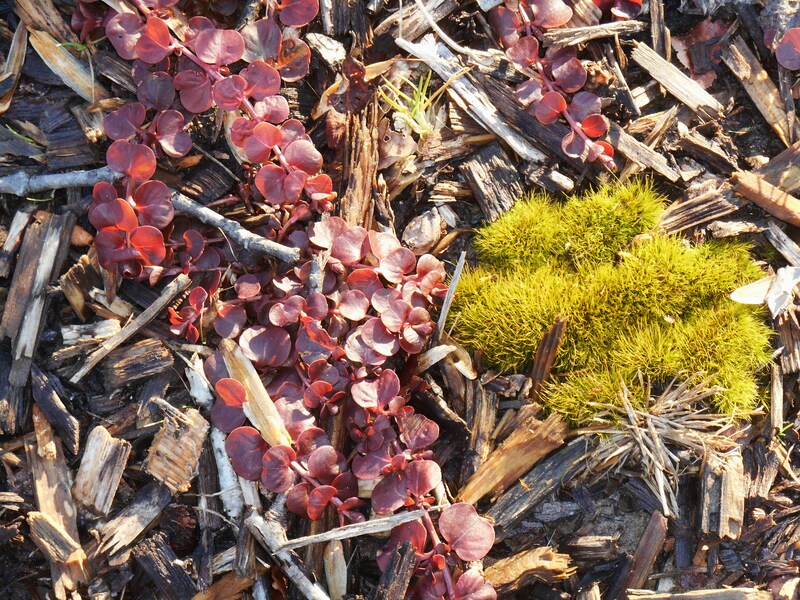 While most of our evergreens are just hunkered down for the duration hoping to survive, the moss glows with vitality. 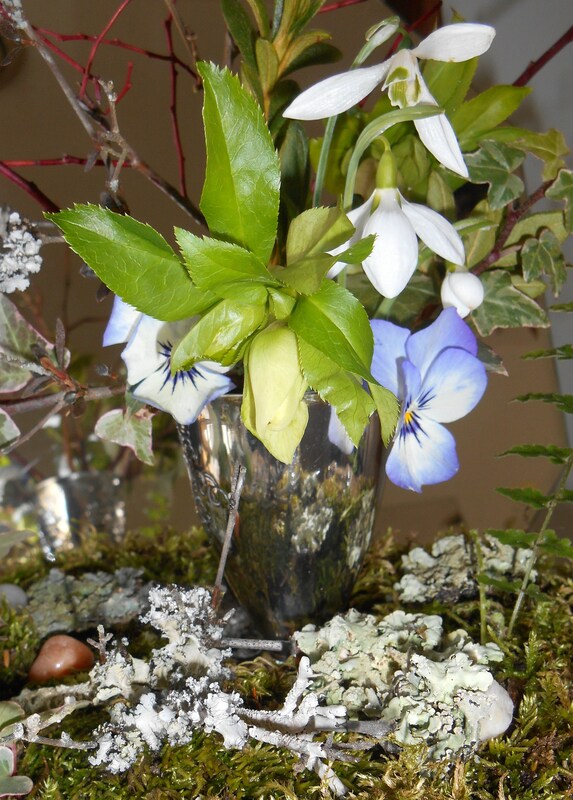 I have placed the vase in the midst of another moss garden, constructed in a shallow glass plate set in a silver charger. Rooted ivy grows and a tiny fern division grow out of the living moss. Perhaps this little vignette will last long enough for the cut branches to respond to our warmth indoors and begin to unfurl their buds. I’ve been thinking of a friend while puttering in the garden today, who with her husband left our community a few years back to move closer to her family on the coast of Florida. She lets me know, sometimes, how much she misses her friends here in Williamsburg, and the magic of our changing seasons. An avid gardener herself, and very talented floral designer, I hope the photos of this little Monday vase will brighten her day and let her know that we miss her, too. I discovered the “Monday Vase” challenge a week ago while following links from gardening blog to gardening blog. Many of the participants tend their gardens across Europe. Perhaps more of my gardening friends from here in the United States will decide to join in with vases of their own as our gardens awaken to spring. What a nurturing thing to do to bring a bit of the garden indoors for our loved ones to enjoy close up once a week! If you love cut flowers, and are curious to see what others have created today, please follow the links in the comments on Cathy’s page. 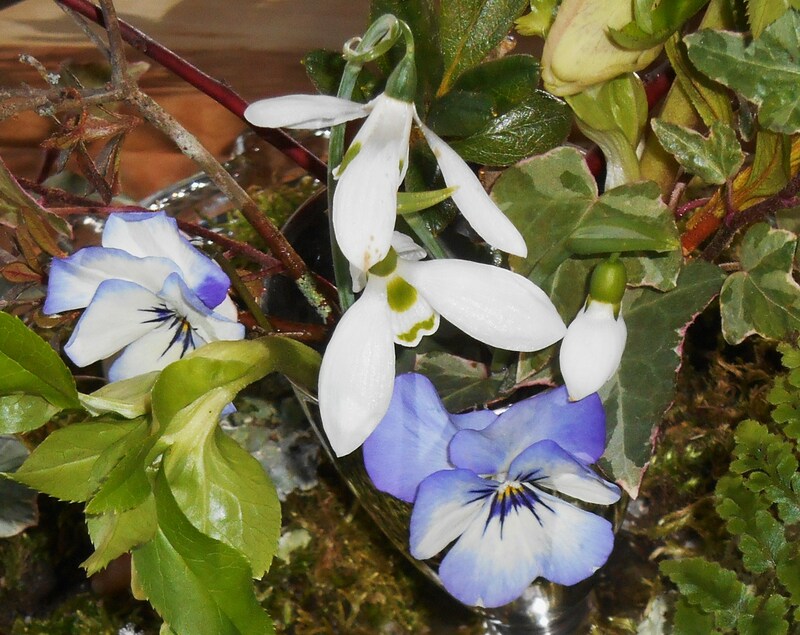 I also enjoyed John’s vase of pansies and parsley today in his lovely cobalt blue vase. Often I hesitate to cut flowers from our garden because I want to enjoy them as they grow. We leave them for the bees and butterflies. And I wonder if they’ll make us sneeze indoors. But after enjoying the beautiful arrangements others have made to join this challenge, I’m inspired. And I plan to make the garden tour with clippers in hand a Monday ritual from here on. I remember golden yellow daffodils blooming in mid-December of 2012 near the James River. They looked so unnatural nodding their cheerful yellow heads right as Christmas lights were shining and we were deeply into holiday preparations. They brought with them a horrible foreboding that our seasons were dangerously out of whack. This December brought a few late roses and early Forsythia blossoms, but blessedly no daffodils. Those of us who choose to live in the temperate areas of the planet appreciate each of our seasons. When they are out of whack, we feel a bit cheated to have missed out on the special joys and beauties of that time of year. No, wintery cold weather came early in 2013, and has settled into our Virginia landscape much later into the spring than we’ve come to expect. Our bare winter landscape is browned out. Even some evergreen leaves, normally vibrantly green throughout the winter, have been frozen into dull brownness. Snowdrops, Galanthus nivalis, is the earliest bulb of spring. Even their name explains their special place in the late winter garden. The genus, Galanthus, is derived from the Greek for “milk,” gala,” and “flower,” anthos. 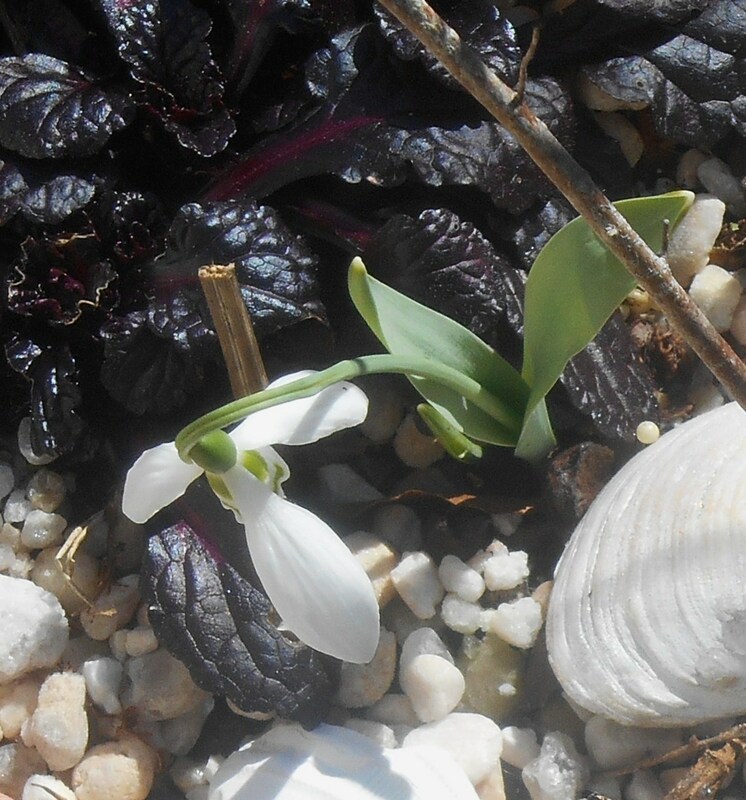 All Galanthus are creamy white, so “milk flower” is an appropriate and descriptive genus name. The species name, nivalis, means “of the snow.” Named by Carl Linnaeus in 1735, the snowdrop is called, “milk flower of the snow.” “Of the snow” refers to both its pristine white appearance, and also to the fact that snowdrops often bloom so early that snow is still on the ground. Snowdrops are our earliest bulb in the garden this year. Not even Crocus, another early bloomer, or Muscari have opened yet. Although I found Crocus last week on a sunny bank along the roadside in our community, none have appeared yet in our own garden. Perhaps because our own winter has been so long and unusually cold, we treasure every jewel like bloom. Each one is greeted with appreciation and happiness because the clear message each holds is the promise that spring has begun unfolding for us. Even during this warm stretch of four days we’ve enjoyed, the local weather forecasters have kept up their warnings of more snow on the way. We’ll drop back to freezing tonight, and we expect an inch of snow on Wednesday, followed by more freezing snow and sleet by the weekend. By Wednesday morning our own snowdrops will bravely bloom above a white carpet of fresh snow. Galanthus nivalis are native to Northern Europe. They are well adapted to grow and bloom in the freezing weather of late winter and early spring in zones 3-7. Williamsburg, Virginia, is on the southern border of their range here in the United States. Perhaps because they are the first bulb of spring, they’ve been hybridized and planted widely throughout Europe and the British Isles. In fact, they are so popular in Britain, Scotland, Wales and Northern Ireland that many of us assume that to be their native habitat. Although widely naturalized in beautiful drifts in woodlands and meadows, snowdrops, or “February fairmaids” as they are often called, probably first crossed the Channel with the Romans. Popularized in the early Sixteenth Century, they were part of the nursery trade between Europe, The British Isles, and the Colonies in North America. Snowdrops are so treasured in the British Isles that many avid gardeners take tours in February to see them in bloom, alongside Hellebores and early shrubs. 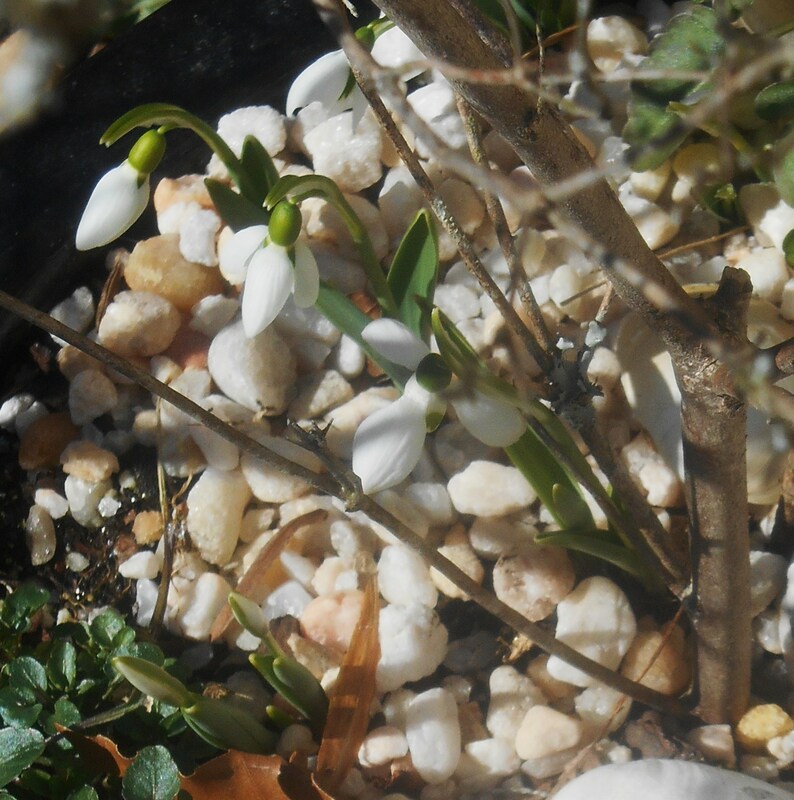 Snowdrops, like many bulbs, are absolutely simple to grow. 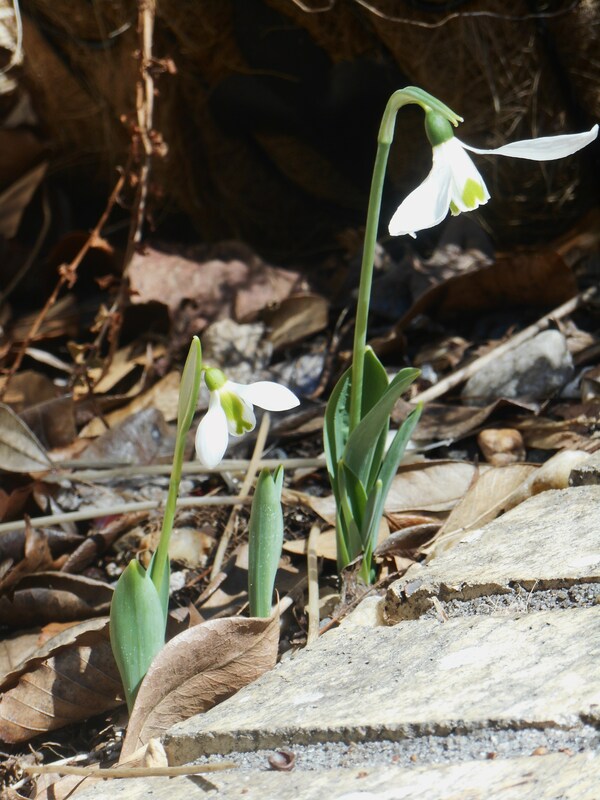 Although it’s always wise to prepare the ground for anything, tiny snowdrop bulbs can be set into tiny drills in the ground, about 2 inches deep, covered, and left alone. They are quite beautiful naturalized into lawn, under trees and along ponds and creeks; planted in beds and borders or pots; or even grown in tiny pots to bring in as houseplants during late winter. Planted in autumn, they need several weeks of cold weather before they’ll begin to grow. 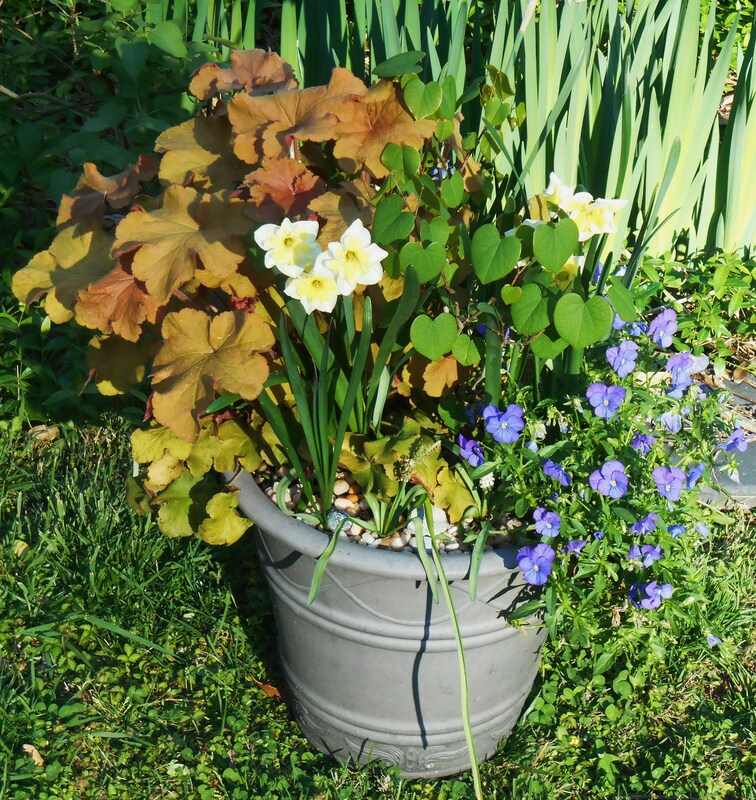 I bought several dozen bulbs this year in December and planted them “second knuckle deep” in outdoor planters where I am growing Violas, Heucheras, ferns, and shrubs. 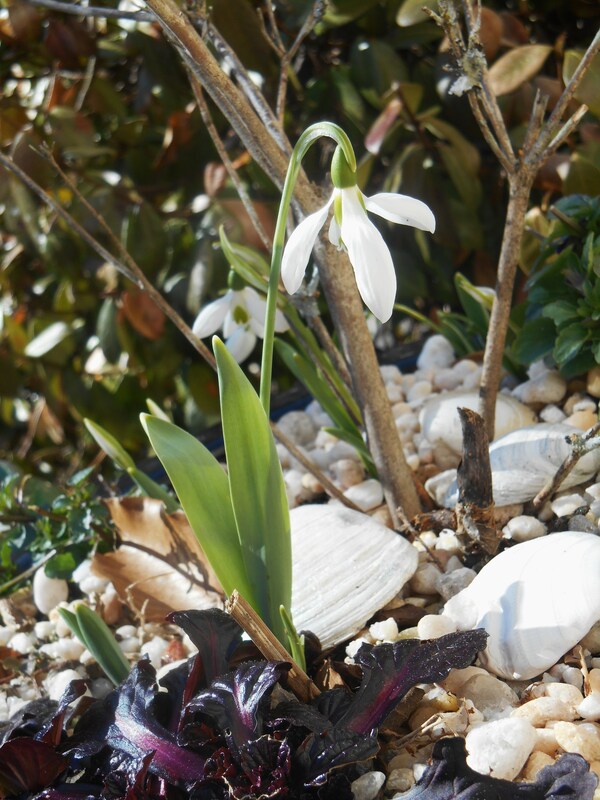 When I switch out the winter/spring plants for summer ones, I’ll lift the Galanthus bulbs and “plant them in the green” elsewhere in the garden. 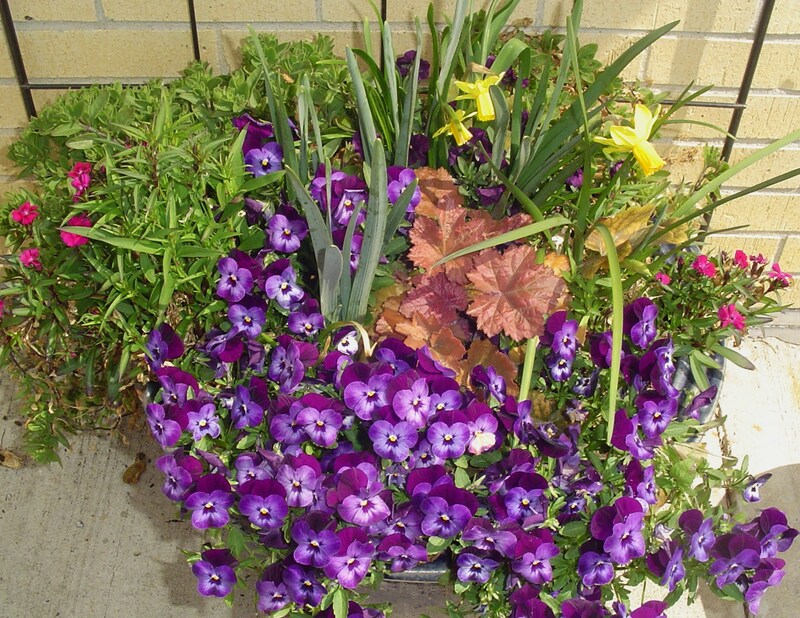 All bulbs need several weeks after bloom time for their leaves to create sugars for next year’s growth. It is important to leave their leaves freely growing until they die back naturally in early summer. Doing this prepares the bulb for next spring’s show, and also allows the bulb to create offsets, or new baby bulbs around its base. When you dig bulbs out of their pots in May you’ll notice several tiny bulbs surrounding the one originally planted the previous fall. This is how bulbs spread, and eventually naturalize an area. Many Galanthus, won’t produce viable seeds. They are hybrids. The only way to increase your bulb display year to year is to dig and divide them. “Planting in the green” means one carefully lifts the bulb, leaving all of the leaves intact, and then gently replants the bulbs at the same depth where they will permanently grow. Water the clump in well, and allow the foliage to continue growing until it naturally dies back. No fertilizer is needed, but if helps any plant to give it a drink of dilute fish emulsion or sea weed emulsion from time to time. 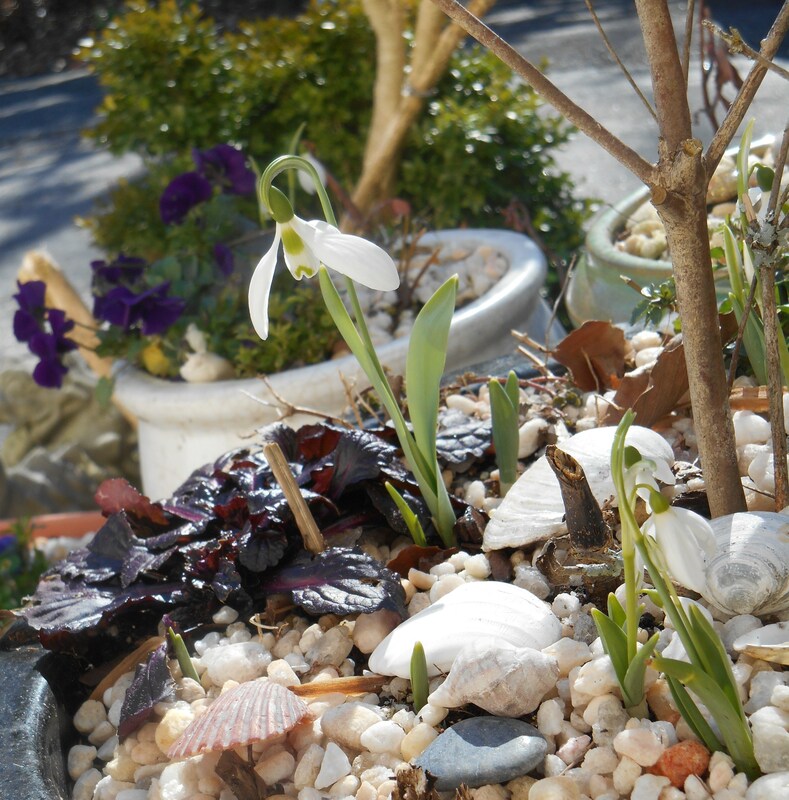 Galanthus really shine in a natural setting. They are beautiful growing at the base of trees, along paths, creeks and ponds. They are individually so tiny, at only about 5″ tall, it is best to plant a great mass of them for a big impact. Plant them where you’ll pass them frequently and pause to enjoy their delicate beauty up close. You might also want to mark them so you won’t forget where they are and accidentally dig them up later in the season. Ignored by deer, they grow well in a wide range of soils, in part sun to partial shade. 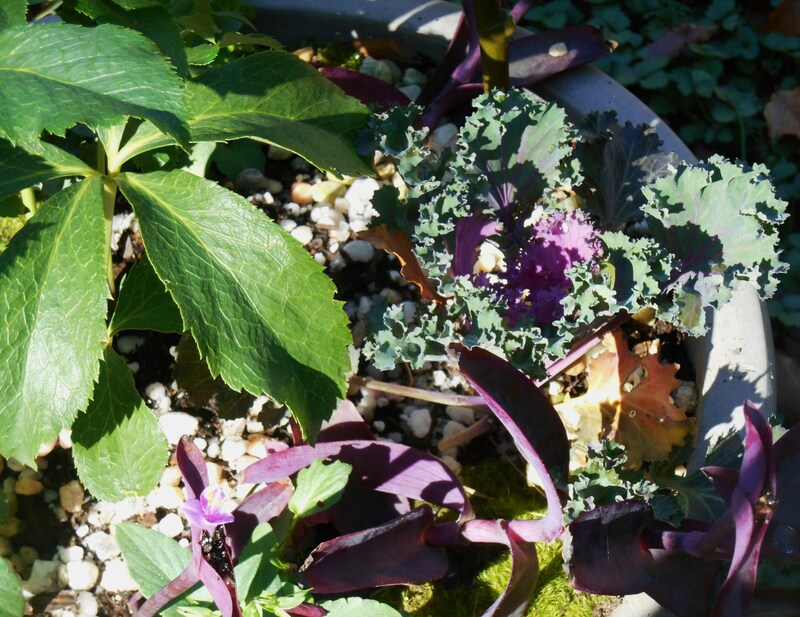 They prefer moist soil when in active growth, but winter soils are generally moist in our area. So in our Forest Garden we are waiting and watching for snowdrops to uncurl their petals as our first tangible harbinger of the change of seasons. Even though winter is returning to our garden tonight, we know its days are numbered, and our snowdrops promise that spring has already begun.